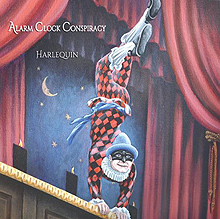 Originating from the hills of Asheville, North Carolina, Americana power-pop group, and brilliantly-titled Alarm Clock Conspiracy - I mean, who amongst us isn't beholden to that annoying, early morning master to our inner servant - have just released their sophomore album, Harlequin. Drawing from the musical stables of Indie Rock, Power Pop and Alt-Country, ACC layer in some 60's and 70's acoustic folk and rock music to bring to the fore some of the most vibrant, honest, commanding music you will allow your turntable to promote. I say turntable, as in vinyl, for as much as this new album is on a CD only at this juncture, it is 100% the kind of music you can hear as an old school record. This wonderful new album opens up with 'Stargazer,' which plays right into the lighter pop-fuzz of 'Got My Mind Made Up,' the acoustic guitar vibe of the title track, 'Harlequin' and then both the gentleness of 'Hard Driving Wheel' and the delightfully collective harmonies on 'Thinking Of.' ACC - Ian Reardon, guitar; Chris Carter, guitar; Wes Jameson, bass; James Hurlston, drums; and John McKinney, keyboards - definitely lyrically showcase the fact that they have two very distinctively different songwriting masters on Harlequin. As the tracks slip by, one by one you can sense which ones (vocally or not) were written by Reardon, which ones by Carter. Having run out of money to complete this second album, after spending a year fumbling in the dark of a pre-existing recording contract, ACC decided to undergo a crowd sourcing campaign on Indigogo.com. Proving, very quickly to be a good move, the band took full control of their album; for the first time ever. But, before we get to that final track, we get served up the delightful 'Creatively Losing Expression,' 'You've Been Content,' and then that said same song; which was also written by bassist, Wes Jameson. Harlequin is a great album, from a great band, that should take up a great amount of your day listening to!